FICO (NYSE:FICO), a leading predictive analytics and decision management software company, today released its quarterly UK cards data showing that average credit card limits are at their highest point in over two years. Consumer spending has also increased, while delinquency rates are down. However, card utilisation rates are at a two-year low, suggesting that some card issuers may need to reassess how and when they offer more credit. Data from the latest FICO® Benchmark Reporting Service revealed that the average credit limit for Classic credit cards has risen by 3.9 percent over the year. The increase was primarily driven by new accounts (under a year old) and established accounts (open between one and five years), which have both seen an increase of more than 6 percent in the last 12 months. Veteran accounts (those that have been open for more than five years) have experienced a more modest average increase of 1.4 percent. Consumer card spending has also increased to its highest point in two years (up 7.6 percent year-on-year), perhaps indicating a strengthening of consumers’ confidence in their ability to repay card debt. This is borne out by the latest data around delinquency patterns. One-cycle balances (where a customer misses a payment for one month) are at their lowest in more than two years, having dropped by more than 16 percent in the last 12 months. “The increase in consumer spending and reduction in delinquencies are good news for card issuers,” said Nigel Brayne, senior director of Global Business Consulting at FICO. “When they see that these areas are becoming more stable, lenders may offer higher credit lines in order to increase individual customer value. 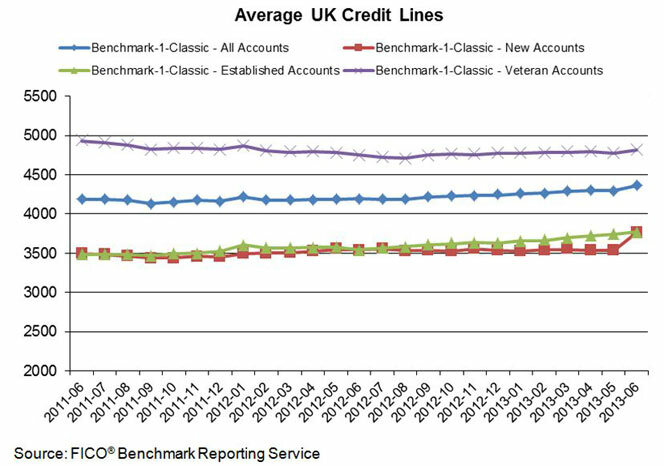 The card performance figures are part of the data shared with subscribers of the FICO® Benchmark Reporting Service, which compares overall market performance in the UK cards market with individual card issuers’ performance. The data sample studied represents 26 million accounts, or about half of all credit cards issued in the UK, and comes from client reports generated by the FICO® TRIAD® Customer Manager solution in use by most UK card issuers. FICO (NYSE: FICO) is a leading analytics software company, helping businesses in 80+ countries make better decisions that drive higher levels of growth, profitability and customer satisfaction. The company’s groundbreaking use of Big Data and mathematical algorithms to predict consumer behavior has transformed entire industries. FICO provides analytics software and tools used across multiple industries to manage risk, fight fraud, build more profitable customer relationships, optimize operations and meet strict government regulations. Many of our products reach industry-wide adoption — such as the FICO® Score, the standard measure of consumer credit risk in the United States. FICO solutions leverage open-source standards and cloud computing to maximize flexibility, speed deployment and reduce costs. The company also helps millions of people manage their personal credit health. FICO: Make every decision count™. Except for historical information contained herein, the statements contained in this news release that relate to FICO or its business are forward-looking statements within the meaning of the “safe harbor” provisions of the Private Securities Litigation Reform Act of 1995. These forward-looking statements are subject to risks and uncertainties that may cause actual results to differ materially, including the success of the Company’s Decision Management strategy and reengineering plan, the maintenance of its existing relationships and ability to create new relationships with customers and key alliance partners, its ability to continue to develop new and enhanced products and services, its ability to recruit and retain key technical and managerial personnel, competition, regulatory changes applicable to the use of consumer credit and other data, the failure to realize the anticipated benefits of any acquisitions, continuing material adverse developments in global economic conditions, and other risks described from time to time in FICO’s SEC reports, including its Annual Report on Form 10-K for the year ended September 30, 2012 and its last quarterly report on Form 10-Q for the period ended June 30, 2013. If any of these risks or uncertainties materializes, FICO’s results could differ materially from its expectations. FICO disclaims any intent or obligation to update these forward-looking statements. FICO, TRIAD and “Make every decision count” are trademarks or registered trademarks of Fair Isaac Corporation in the United States and in other countries.